America’s economy is in good but not great shape this year. Wage growth — the missing piece to America’s economic progress — remained sluggish in July. Average hourly earnings only rose 2.1% compared to the prior year. Wage growth is the reason many Americans haven’t felt the benefits of the economy’s recovery. The Federal Reserve wants to see annual wage growth closer to 3.5%. What will the Fed do? The jobs report is extra important now because the Fed is close to raising its key interest rate for the first time in over nine years. The Fed has said it will only hike rates if it believe the economy is healthy enough, especially for workers. A rate increase would be a good sign for the economy’s health, and how far it’s come since the recession ended. The takeaway: Economic growth has been okay this year — solid but nothing to get excited about. 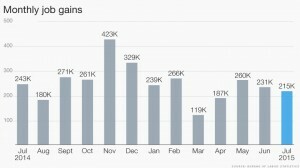 Last year, the economy added 240,000 jobs a month on average between January and July. This year that figure is 178,000 — a sign that job growth in isn’t as stellar.